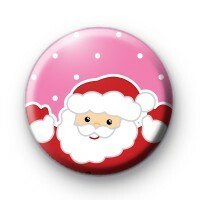 A pink Father Christmas badge with a pink background and snowflakes & featuring one of our really popular Father Christmas (Santa Claus) designs. Father Christmas is wearing his red and white Santa suit & looks extra festive & jolly (and a little plump this year). We have this father Christmas badge in various background colours, including green and blue so be sure to have a browse through the rest of our Christmas badge category for our other father Christmas badges and Santa badges. These badges are made by hand in our family run workshop (and at this time of year, you better believe we have a few of Santa's helpers helping out). Our Christmas badges are really popular each year & we offer free worldwide delivery on larger orders. These are great for teachers who hand them out to students but are beloved by all kids (and big kids) too. Our Xmas Badges are some of our most popular designs so be sure to order early. They make great secret Santa gifts, stocking fillers & small Xmas gifts.